Improvement of your drawing skills is not just about having the best tools or materials for drawing. It is also about some know-how artists find out during the years of their practice. This article will show you the basic tips for improving your drawing skills. You should start every drawing with sketching the basic outlines. These outlines must be really light so you can easily erase them in case you make a mistake. If you draw dark lines, it is hard to erase the lines without smudging the graphite and disrupting structure of the paper. You can use F or HB pencil or a thin mechanical pencil with no pressure in order to make soft and light basic outlines. Keep looking at the reference. When you draw according to a reference photo try to look at the reference very often and let your hand naturally make as similar shapes (lines) as possible in order to get the right proportions of the object of your drawing. It is like catching a fly ball – if you keep watching the falling ball your hand will catch it with high probability because when you keep a visual contact with the ball your brain estimates direction and speed your hand should move to catch it. Just do not be afraid to trust yourself and give your hand some space. There is a lot of graphite on your drawing when shading – therefore you should put an extra paper under your drawing hand in order to avoid smudging it. Moreover it is always better to start with shading the right part of drawing when you are left-handed or the left part when you are right-handed – this will minimize smudging your drawing to minimum. 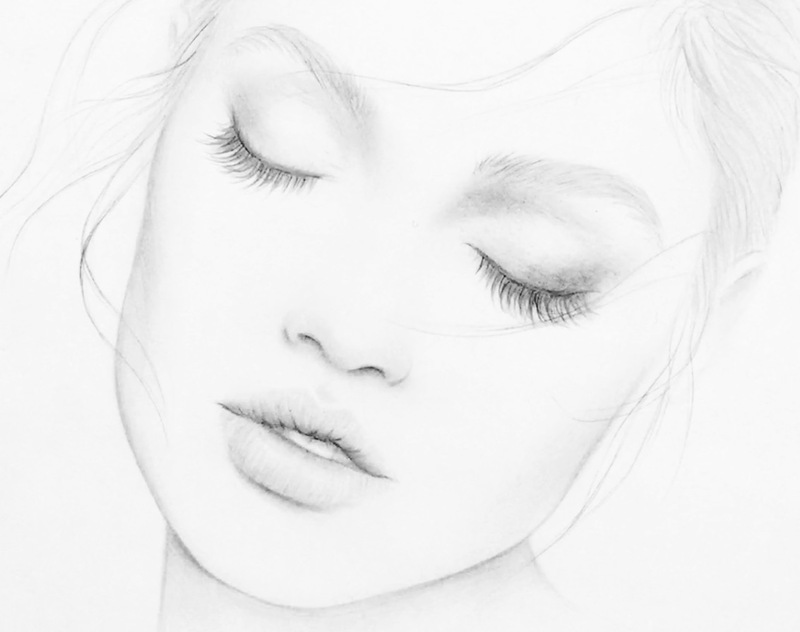 It is always better to add more soft layers of shading than to put pressure on the pencil to make immediate darker look. You can use a blender/stump/cotton swab/tissue to blend your pencil lines. Blending will merge the lines or different tones/shades together. Your drawing will be smoother and look more realistic. Do not be upset if your drawing does not turn as you wish to be in few moments. Be patient and give it some time to get improved. It is a difference if you take few minutes and few hours to finish the piece. Sometimes it could take years. But all this is about practice. Draw every day. Draw anything you like. Enjoy it. When you start learning drawing you might make a lot mistakes in the beginning. But DO NOT give up because you make mistakes. We all make mistakes (even after a long practice). You may let the mistakes define you or you may take them as a chance to make a progress and let them be your guide in it. Be confident. The self-confidence might help you more than any drawing tutorial. I love your work! I am a artist myself and I struggle with lips and hair. I would love to see a tutorial on how you do it. I admire your skills. First time I saw your work today. Very lovely. Thank you so much for sharing your knowledge.